We all know about dating service Lunch Actually, but how much do we really know about what they do? Personally, my only knowledge of the company was when I covered them on their recent 7-digit funding, and their massive success so far. But first of all, I have a confession to make – I’ve never experienced using dating services or apps firsthand! Perhaps it’s also due to my luck of somehow being at the right place at the right time, and thus haven’t found a need to turn to them for some extra help. The idea of a matchmaking service is even more of a mystery to me, and I tend to think of old, slightly chubby ladies grabbing any single men they know and setting them up on random (mostly awkward) dates with single ladies. Thus, when I was tasked to go and experience Lunch Actually‘s offerings, I went in with both trepidation and a very hungry curiousity. But first, a short introduction to the company for the unacquainted. 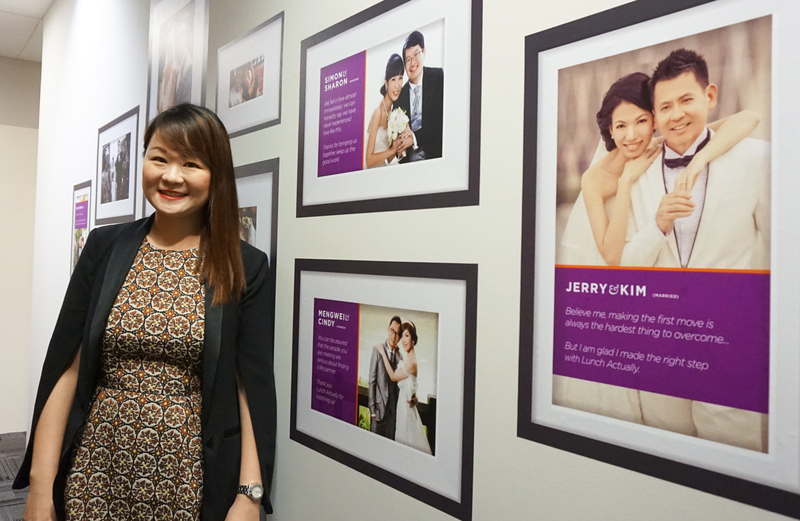 The company was conceived by then fiancé-fiancée team Violet Lim and Jamie Lee (now married) in 2004, offering an offline dating/matchmaking service solely in Singapore, and has since expanded to 6 cities with over 100 associates. 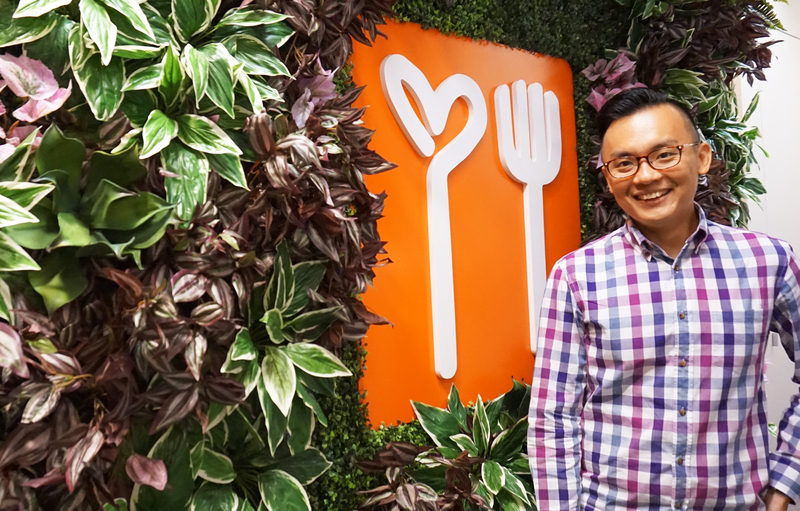 Their latest expansion took place last year in Bangkok, after the acquisition of the biggest dating service in Thailand, MeetNLunch. They have also revealed to me their plans to expand into the Philippines next. We’ve also recently covered the news on their 500% revenue growth, alongside a cool 7-digit Series A round of funding from Japanese social networking service and publisher mixi, and Fatfish Internet Group, a Southeast Asian and Australian-based ventures investment and development firm. Their recipe for such sustained success? Having products that cater to singles with different needs. 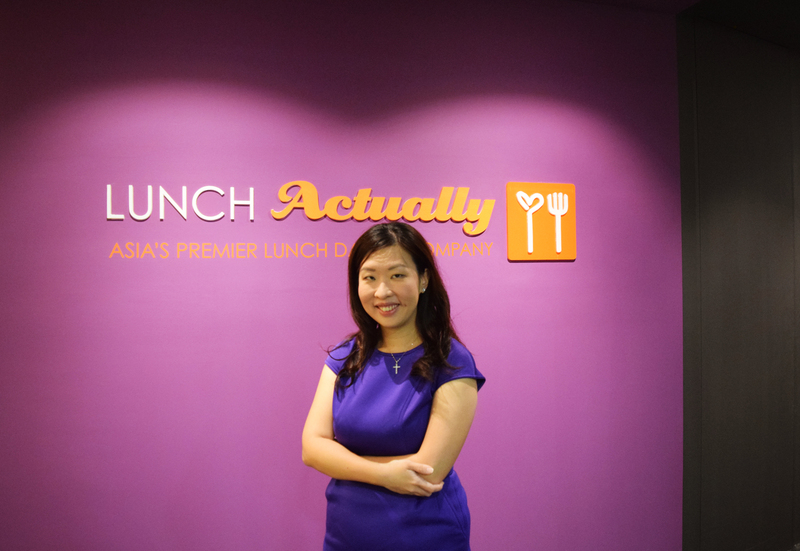 Lunch Actually is their matchmaking service, and is for those looking to meet eligible singles offline. For those who prefer mobile dating apps, LunchClick is their answer. 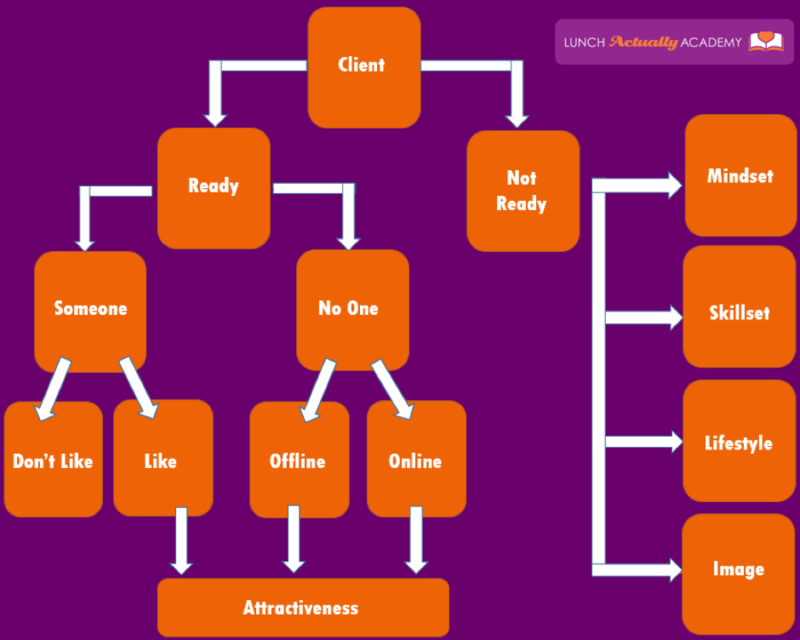 eSynchrony is a fusion of both of these, giving those who prefer a mix of both online dating and a personal matchmaker. 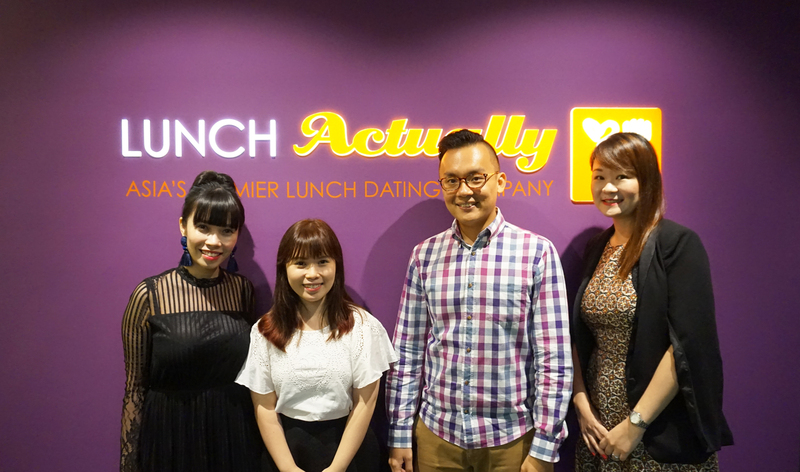 Lunch Actually Academy, on the other hand, are coaching services for singles who are looking to improve their dating skills and their image. It also provides relationship coaching for couples who encounter issues in their newly-minted unions. Marriage coaching, however, is still a work-in-progress, but Violet revealed that they are definitely working on it. 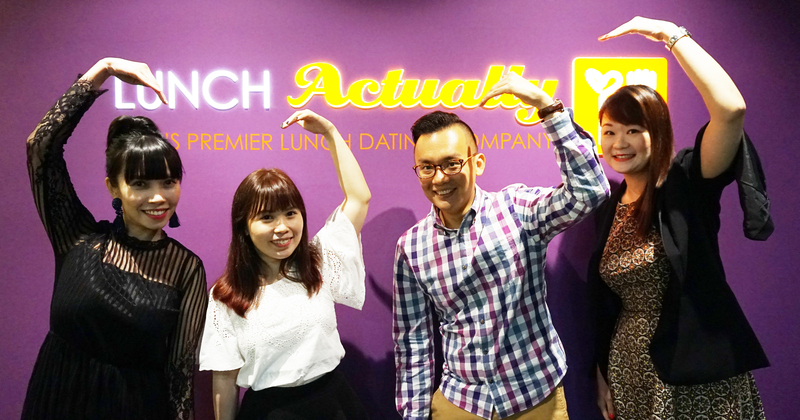 For this article, the team had kindly offered me 3 of their services – Lunch Actually‘s Profiling and Matching, and Lunch Actually Academy‘s Date and Image Coaching. Did I have many preconceptions of them? Definitely. Did I know exactly what I was getting myself into? Not really. Arriving at their office, I realised I wasn’t the only guest for the 2pm appointment. Waiting with me was an attractive-looking lady, probably in her early 30s. “She needs help in dating meh?” I thought to myself. 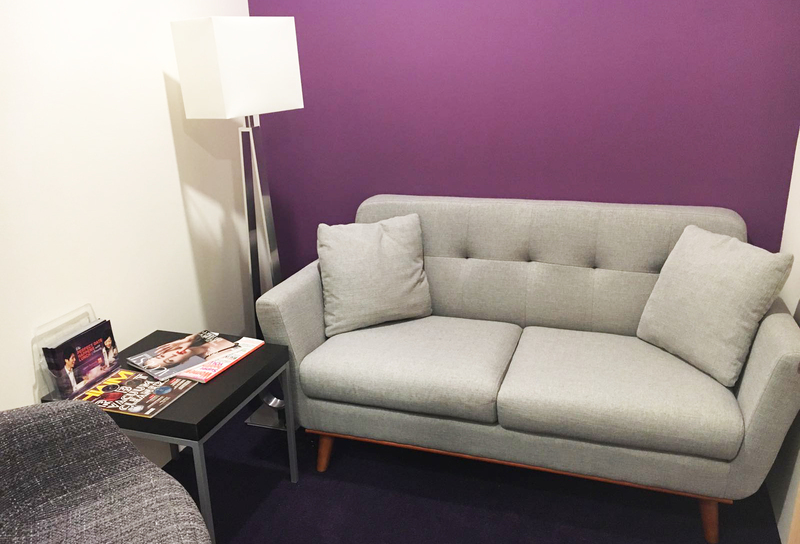 However, my train of thought was quickly interrupted when a staff soon arrived at the glass door and let us in, leading us to two different consultation rooms, all featuring a wall painted in their signature royal purple colour theme. Next to the door was also a full-length glass window which was partially frosted – which I noticed provided a sense of privacy, yet without the feeling of claustrophobia. I was scheduled to meet Andrea, a senior dating consultant, for Lunch Actually‘s profiling and matching service, and after barely warming up the seat, there was a slight knock on the door, and Andrea came in, flashing a warm smile. After explaining my slightly confusing conundrum (I am actually attached) to her, we went ahead with a part role-play, part behind-the-scenes approach to our consultation. At Lunch Actually, the tedious process of looking for potential singles to assess, then gauging their interest in you, to eventually asking them out and setting a date is completely taken care of by the team. So for all of you who are simply too busy to socialise – their service is a god-send! In a way, you can think of the team as your “personal assistants” when it comes to dating. However, to ensure that clients get decent matches, the Lunch Actually team also takes profiling very seriously, and requires them to provide their ICs (to check their marriage status in ROM), latest salary slip and also highest education certificates before verifying them. This might seem invasive, but imagine the rude shock, and even potential dangers, if you find out that your blind date is not who he/she was made out to be! As an example, Andrea then went on to ask me questions to build up my profile – from questions like what my height is, to what ethnicity and religion I preferred, and if I’d prefer someone who was more outgoing or indoor-sy like myself. Andrea emphasised that Lunch Actually‘s system of profiling and eventual matching is much less about hobbies and physical attributes, but about the qualities of an individual. Which makes sense, because I’ve had a fair share of experiences when common interests and “being cute” was simply not enough to make the attraction last. With profile pat down, Andrea explains to me that the consultant would then be excused for 5-10 minutes to do a quick and thorough check in their database for potential matches, before recommending the clients packages which would include a specific number (1, 2, 3, 5 or 10) of pre-arranged dates. For a 26-year-old female like myself, she recommended a 10-date package, because younger females tend to have more options, and their male clients tend to be more willing to date those younger than them. Interestingly enough, younger males are on the flip-side, and have a lower proportion of matches since females tend to exclusively prefer older, and more financially-established males. For privacy purposes, and also to ensure that clients do not miss out a chance on a great match solely based on a single photo, the profiles do not include photos of their match, and nitty-gritty details like company where they work at, or exact height and weight, are not revealed. So say goodbye to stalking your match on social media before a date. If all goes well and both ends agree, a common time is set, and the team makes a reservation under their two names, which would also be what serves as the means for identifying your date. So yes, say goodbye also to the old-school method of clutching onto a rose as a form of identification. Once the date is over, consultants would gather feedback from each party on the date, and these would meticulously be recorded in their system. What about, I asked, those who consistently can’t seem to find success in their dates? Andrea explained that due to their stringent matching system, character mismatch is more or less eradicated, so it might be an issue from the individual – for example, bad table manners – all of which can be identified by the feedback recorded from previous dates. In such a case, the client would be informed of the issue, which they would then aid to solve. The good thing is, she notes, is that Lunch Actually‘s clients are in general very open-minded and teachable, and that’s partially also the reason why their date satisfaction rates are at a high of 85%. Verdict: I was, needless to say, intrigued by my possible matches (sorry, boyfriend! ), but the session definitely opened my eyes. By focusing on qualities as compared to superficial traits like looks and hobbies, I could also imagine that success rates and longevity are much higher than if using other dating services. The answer was yes, and if you’re a listener to Kiss 92fm‘s morning show, you’d probably recognise his name too. A regular instalment on the popular morning show every Tuesday, Kydon drops by to discuss and advice on common dating conundrums and mistakes that people tend to make, but don’t realise they do. From bad texting habits, to deal breakers, Kydon covers all the topics you’d usually discuss at length (with real-life examples) with your friends over dinner, except that he knows exactly the best possible ways around them. So imagine having a radio celebrity of sorts as your personal dating coach! Regardless, Kydon then explained to me how his coaching sessions tend to go about – by first of all finding out what potential issues that each client has. He then gets to work accordingly, giving personal anecdotes of clients in each category along the way. Since dating these days are so much about how people interact online via text and off via dates, he does lessons for both, and even goes through Whatsapp conversations to deduce the mystery of why certain clients keep encountering similar issues! As he carried on with his thorough explanations of his processes, I slowly realised something – this was exactly like getting tuition for a certain subject we can’t excel in (for instance, Additional Maths), except getting help for dating chops is usually seen as taboo. Think about it. Many of us think that date coaching are only for ‘losers’, but how many of us have also encountered similar issues happening to ourselves, and our very eligible friends as well? Which explains the very structured approach that I was observing with his coaching style. And just like grades can improve with tuition, dating knowhow can also improve with coaching. Lunch Actually Academy also offers relationship coaching, for those who are already attached, but find troubles making it a successful union. Kydon and team then steps in as a neutral third party – to provide objective advice without siding of either. Which makes sense, since going to our personal friends to rant tends to result in us getting even more angry at our partners, thanks to our biased, but regardless, protective friends. Verdict: Due to assumptions that dating skills ‘should come naturally’ for all, many of us tend to forget that those who seek such help are simply weaker in this ‘subject’ as compared to ourselves. Even as someone who is happily attached, I could also totally get that having a neutral opinion with sound advice from a coach is really helpful in maintaining a healthy, functional relationship. Lastly was image coaching with the impeccably-dressed Katheryn. Out of the rest, hers was definitely the ‘lightest’ out of all, making it a perfect end to my rather intensive session. Even before starting my session with her, I couldn’t help but notice how the matching of her outfit, shoes and accessories just helped to elevate her look entirely – something which I thought was very impressive. I mean, how often do you see Singaporeans with so much effort in their dressing? “No wonder she’s an image coach.” I remember thinking to myself, as I settled down. For the next 2 hours, my mind was blown over and over again. 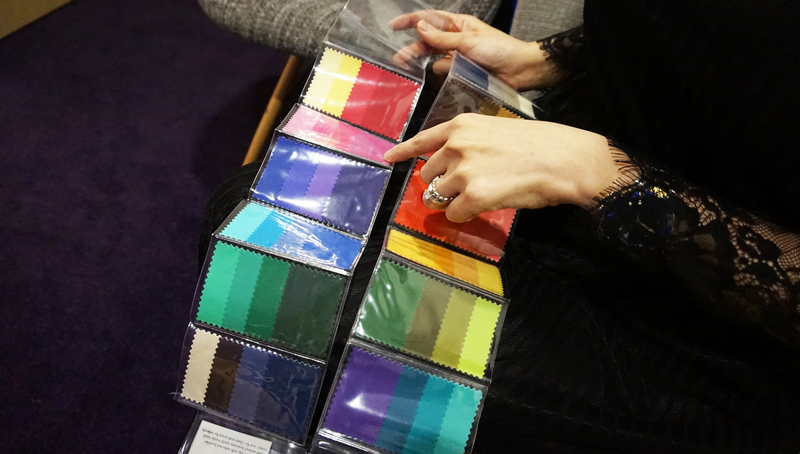 With a colour chart, she explained that skin undertones were the most important to note when picking colours for outfits, and shattered my longtime belief that I had a warm undertone. She then continued to play psychic and accurately guessed my preferences of dressing and accessories, all of which, she revealed, comes from her years of experience with clients of various dressing personalities. But enough about me, when I asked about her clients, and if they tend to be made up of a particular demographic, she said that male and female clients are on par, and most are in their mid 20s to mid 40s. 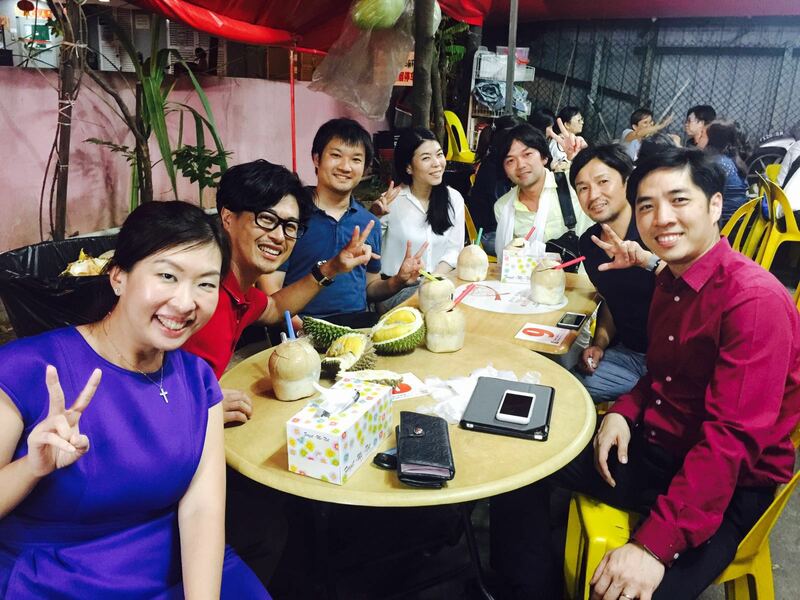 Many of them come to her lessons also not just for a better impression on dates, but for professional image as well. Which, if you think about it, is equally, or even more important to an individual since first impressions count not only in love, but also professional life. She then went on to do a process called ‘draping’, during which she literally drapes pieces of cloth on your shoulder to see how they complement (or not) your skin. I was initially skeptical, but after seeing how a particular warm shade of red washed me out, and how a cool shade made me less like a corpse and more like a healthy human being…I was SOLD. Due to a shortage of time, we then made a quick trip to the nearby mall’s Etude House makeup store, where she shared with me the shades of lipstick and eyeshadow that would suit me best. For clients, shopping trips are a main part of the lessons, and coaches work around their budgets and become their personal shoppers each time! Not just for outfits, coaches also give advice for “every item from head to toe”, and even makeup and perfume advice if a client requests for it. I can imagine how many who are looking for an image refresh would greatly benefit from the image coaching sessions, since getting generic advice online isn’t always the most helpful! Verdict: Even though I wasn’t a paying client, I was seriously blown away by how Katheryn offered me advice non-stop for the whole 2 hours! While image never seemed like an issue for me, I realised that getting to a decent state without personalised, professional help actually resulted in learning from many (sometimes expensive) mistakes. Before I left, Violet was generous enough to take some time out of her very busy schedule to meet and show me around the backend of how the magic happens. Bringing me into their office, she, along with her staff showed me the system that consultants use to create matches, log feedback and track the progress of their clients. I never knew there was so much nitty-gritty work going into such a seemingly ‘simple’ process! Violet also revealed that the consultants also tend to get very emotionally involved with their clients’ progress, and any success that their client experiences results in loud whoops of joy all around the office. The genuine warmth that I felt from all my interactions with Lunch Actually‘s personnel made me believe that they are really invested in their client’s happiness. Settling down in a room, I asked her about her inspiration in leaving her bank job and taking a leap of faith by setting up such an unconventional business. “Everyone thought I was crazy!” She laughed, and elaborated that she was noticing a very strange, but common trend among her same-age colleagues and friends. She realised a pressing trend of working adults not being able to find good potential matches because of busy schedules, gender-specific industries, or both, and set out to solve that with Lunch Actually. However, she realised the taboo that came with dating and matchmaking services. What she aimed, and still aims to do then, is to make these services mainstream, and having clients undergo dates over lunch makes the process less intimidating as compared to the traditional practice of blind dates over dinner. Lunch is also a midday break that clients would be able to afford even with busy schedules. She notes, though, that Lunch Actually dates aren’t specifically over lunch, actually, and many clients tend to choose weekend brunch time slots nowadays. Lunch Actually‘s goal is to also push dating to happen offline, something that competitors aren’t encouraging enough of. This is one of the reasons why they “killed chat” on all their platforms, making sure communication only happens face-to-face. Offline dating also means that individuals tend to be more open to meeting partners which attract them based on character, not just a very well-taken selfie. Whether or not someone is interested in you or not is also easier determined. As someone who has been active in community service all her life, she emphasises that while Lunch Actually is a business, her drive comes in helping people find happiness in love. Coupled with goals of expansion, which she revealed was “never a choice, because we never wanted to stay as a mom-and-pop shop”, she states that Lunch Actually’s success only helps them to do “even more good”. With over 80,000 successful dates so far, Violet and team’s strategy is definitely working, and making a wonderful difference in the lives of those who need help. Final Verdict – Are The Fees Worth It? Just like many, I went in with misconceptions, but came out not only being proven wrong again and again, but also enlightened by how the team is taking on such a structured, and effective approach to solving dating problems. There’s a lot that goes into dating and finding a partner that many of us (especially those who are attached) take for granted and overlook, and talking with the staff made me realise that while the problems are real, they are very solvable with patient and strategic advice. As for the million-dollar question on whether the fees are ‘worth it’ or not, what I realised over the course of the four hours was that clients are signing up for more than just a package – they’re actually forming a partnership with the team. From the very customised matches selected to best suit one’s needs and personality, to the similarly personalised coaching sessions that pinpoint the boo-boos you make without realising, the packages are a fast track to success for those who simply don’t have the time to waste on bad choices. And really, when there’s work and responsibilities fighting for your precious hours, who has the luxury for ‘experimentation’? Lunch Actually might have gotten flak for their relatively pricey packages, but for their clients, the help they’re getting from the team is simply priceless.